So far, London Fashion Week has been a mixture of summery collections mixed with very autumnal collections – bizarre. Colour palettes have been muted and jackets have been prevalent. 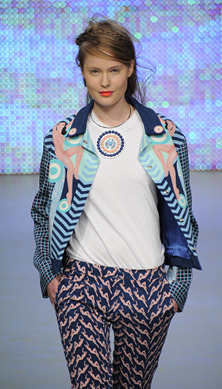 Nothing has really screamed “summer” or “vacation”…aside from Holly Fulton’s collection which is her signature riot of colour and print. Inspired by the exotic climes of Mexico, the collection features saccharine bubblegum hues and bold, bright florals. Black has been consciously omitted which helps to emphasise the lightless and prettiness of the collection. Florals, exotic skins and leathers intertwine with Fulton’s signature graphic prints and embellishment for a bold, summery look. One of the key influences is 60s skateboarder Peggy McGee, fabrics such as airtex, luxe silks, fine leather and sweatshirt material bring in a laid-back and relaxed edge to Fulton’s high octane signature motifs.